Home / SOM / Strain / Stress / What is stress and strain? I hope you are doing well in your study. I generally write articles on Automobile, Production etc. But now we are going to start to provide the best quality articles on strength of material which is an interesting subject and also a very important as exam point of view. It is our first article in this segment. I hope you like it and if you want to learn this subject I suggest you subscribe to our website. This is our first article and most of you know that SOM is totally depended on stress and strain concept. If you are able to understand this two word completely, you will never find any difficulty in this subject. Now stop rounding, let’s start the discussion. Let’s learn with an example. Take a rubber band and start to pull it. Now remove the load and observe its behavior. The rubber band gets its initial dimensions completely. Now take a wire or rod of steel and start to pull it. What will happen? The steel wire is not permitting the deformation on manual loading. Ok, let’s pull it through an external loading and observe it on a microscopic level. If you observe it consciously, you will find that it also deform and gets back its original position after removing the load. We can also observe that if we increase the loading continuously, it will break the wire or after removing the load the wire does not get its original dimensions. In above example, we have observed that the steel wire need more load to deform compare to rubber wire and also rubber wire deform more. 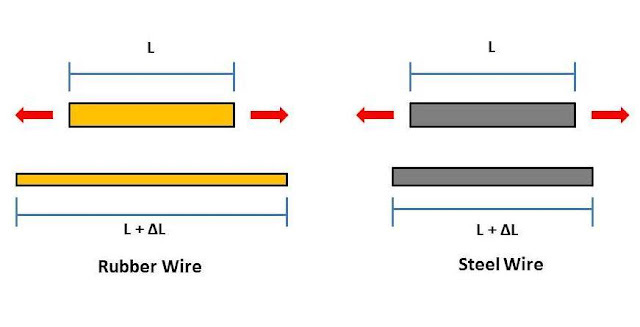 Both steel and rubber wire gain their initial dimensions after removing the load. Why it so? After performing this experiment, we can conclude that there is a reinstating force in any material which tends to resist deformation. The rubber wire has a small reinstating force so it deforms easily while the steel wire had high reinstating force which needs more load to deform it. This resisting force per unit area is called STRESS. In an equilibrium condition, this resisting force is equal to the applied load. According to the definition resisting force per unit area induced in the body during external loading is called stress. We have discussed that the resisting force induces in the body is equal to the applied force so mathematically stress is the ratio of the applied load to the cross-section area of the body. It is represented by the symbol σ. According to the loading, stress can be divided into two categories. The first one is normal stress in which the load is either compressive or tensile. Both of these loads try to deform the initial dimension of the body. The other one is shear stress in which two equal and opposite loads are applied to the parallel faces of the body which try to deform its dimension. I think at this point you have a confusion between elasticity and stress and how both differ. Don’t be confused, the elasticity is the property of any material due to which it gets its initial dimension after removing loading while the stress is induced in the body due to loading which tends to resist deformation. The stress also depends on the shape of the body while the elasticity depends on the material. The strain is just a measurement of deformation induced by the application of stress. According to the definition, the ratio of change in dimension to its original dimension is called strain. become L + ∆L. The ratio of ∆L to L is called STRAIN. It is denoted by ɛ. Now I think one confusion striking your mind that why we need this type of measurement or why the researchers describe this quantity. The answer is quite simple because the stress is directly proportional to strain. So we have to measure strain to describe the relationship between stress and stress. These both term relationship describe the safe loading and deformation phenomena of anybody. Same as stress, strain can be divided into compressive strain, tensile strain, and shear strain. There are two more different types of a strain called lateral strain and longitudinal strain which we will discuss in the next article. Today we have learned about stress and strain. I hope you have liked this article. If you have any doubt or need any improvement, kindly inform us through commenting. We will try to improve it. Kindly share your views on this article so we can improve ourselves. If you like this article share it on social media with your friends. Subscribe our website for more informative articles. Thanks for reading it.